Dumplings are a food found in virtually every cuisine. Chinese-style potstickers are beloved by many. Make your own at home with prepared wrappers, shrimp, and Chinese broccoli. Of course, you can't forget the incredible dipping sauce made with soy sauce, Chinese black vinegar, fresh ginger, and red Thai chilies. Once the potstickers are assembled, they cook up quickly and easily in just about 5 minutes flat! Once you have the techniques of this recipe down, try altering the filling ingredients to create new and interesting flavor combinations.Use a glass lid so you can easily monitor the potstickers cooking. The pan gets hotter with every batch and you may have to adjust the heat, lowering the temperature accordingly. Per Serving: 691 calories; 27g fat; 80.2g carbohydrates; 31g protein; 166mg cholesterol; 2929mg sodium. 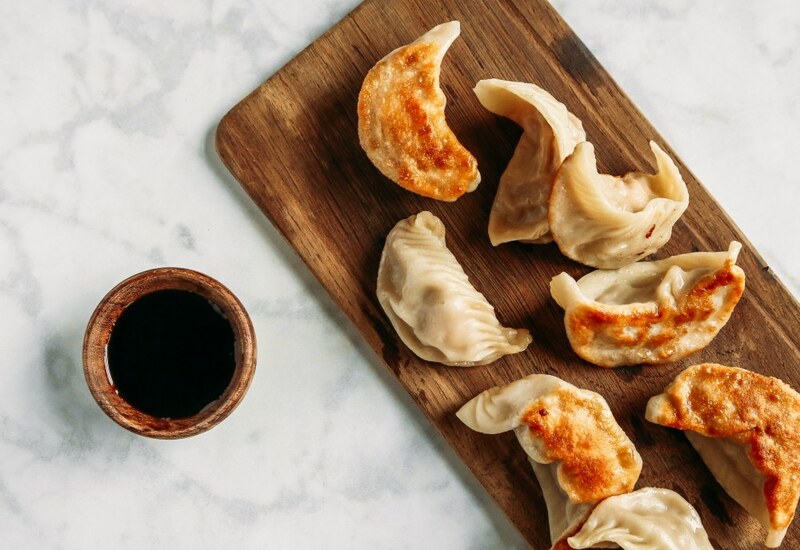 This dumpling recipe yields a gorgeous and delicious result. Corinne's instructions for frying the potstickers worked perfectly for me. I got a tender filling and dumpling top, while the underside was crisp and golden. I've always loved potstickers, but would buy frozen because I assumed they were difficult to make. When I came across this recipe I was eager to try it out. So glad I did, this dish is quick and easy. The shrimp and broccoli filling was delicious, and they were steamed and sautéed perfectly. I definitely will not be buying frozen again, now that I know how simple these were to make.